The previous generation Rodeo was a very quick scooter. It had a sporty ride quality (stiff but not uncomfortable) and a refined and quick engine. Now Mahindra has gone ahead and launched an updated Rodeo and just like it did with the Duro update (DZ) they have named it the Rodeo RZ. So what's different? Not much visually. Most of the change is to the engine - a new ignition system and a new carburettor. The Rodeo was one of the quicker 125cc scooters we had ridden. The RZ is no different. In our tests it hit a top speed of 85kmph which is 0.17kmph more than the segment benchmark  the Suzuki Swish. The power delivery is linear and stress free. Whack the throttle open and there is not much noticeable delay before the scooter picks itself up and gets moving, hitting 60kmph in just 9.2 seconds. This makes it 0.2s quicker than the old Rodeo and 1.45s quicker than the Swish. When it comes to economy however, the Rodeo loses out to the Swish. Where the Swish gives 56.3kmpl in the city and 58.8kmpl on the highway the Rodeo returns only 45.6kmpl and 56.2kmpl. This is a difference of 8.62kmpl in the overall efficiency between the two. However at 48.25kmpl the RZ is still more frugal than the older Rodeo which used to return 45.9kmpl. Swish, the Mahindra feels much stiffer. The ride quality might not be what you call plush but it is not harsh either making for an acceptable compromise. The styling on the Rodeo remains the same and does not look as dated as, say, the Activa. In the segment the Rodeo slots somewhere in the middle as far as styling goes with scooters such as the Dio and the Vespa above it and others like the Activa below. It comes loaded with a lot of features such as a multicolour instrument console, a mobile phone charging point, front fuelling and an illuminated 22-litre underseat storage area. The Rodeo has always had better build quailty than the Duro and while the RZ's fit and finish has improved but not by much. 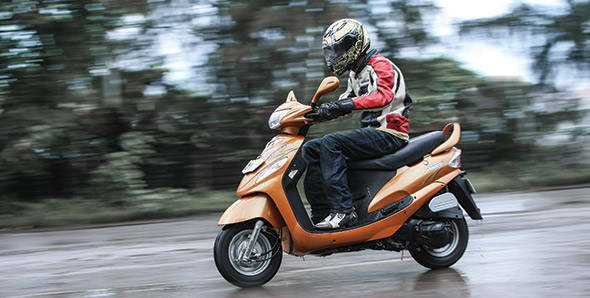 The Rodeo RZ is priced at Rs 47,411 (ex-Maharashtra) which makes it roughly Rs 3000 less than the Swish and the older Rodeo (the only other scooters that are less expensive are the Wego and the Dio). So if you're looking for a quick scooter to putter around town, the Rodeo RZ might be the one for you.